Click HERE to schedule your next appointment. If you want or need to lose weight, acupuncture can help you achieve your goal. Research shows that combining acupuncture with healthy eating can significantly increase the rate at which you get lean by helping you make better food choices. According to the National Institutes of Health, more than two-thirds (68.8 percent) of U.S. adults are considered overweight or obese. More than one-third (35.7 percent) are considered obese. Almost 3 in 4 men (74 percent) are considered overweight or obese. Reducing body fat is preventive medicine. We would like to help as many people as possible achieve a healthy body weight and composition. Research has shown that people who combine a proper diet with a course of 12 acupuncture treatments (twice weekly for 6 weeks) lose significantly (75%) more body fat mass, and had greater decreases in BMI, waist circumference, and hip circumference, than patients who had sham acupuncture. You can reduce your weight as fast as possible by combining acupuncture with the best weight loss diet: an ancestral natural foods diet, which has been shown to reduce excess appetite and improve weight loss and cardiovascular risk factors compared to conventional weight loss diets. 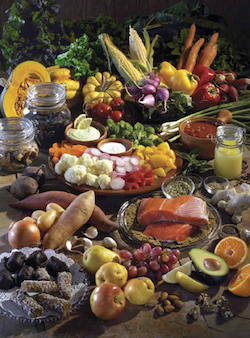 Eat real natural foods like fresh fruits, vegetables, roots, tubers, nuts, seeds, meat, poultry, and fish. Total value of this package is $690. We’re offering this package for only $500 to the first 5 people (that's just the cost of the acupuncture!) who enroll before March 31, 2017. After that the price will be $575 for anyone who registers & pays by March 31, 2017. After March 31, 2017 the standard price for this package will be $600, still a $90 savings. We require direct contact with the Earth to stay grounded and maintain health. I recommend that all of my patients spend as much time as possible properly grounded by walking barefoot on the Earth as often as possible, and using Earthing products so that you can be grounded while they sleep and work. Barefoot Acupuncture Clinic 6722 E. Avalon Dr. Suite 1 Scottsdale, Arizona 85251 602.954.8016 © Don Matesz, 2013. All Rights Reserved.